Growing up we would often drive past a business that would have a catchy, relevant, thought-provoking or seasonal saying on their sign. We were always interested to see and read what message was being displayed as we passed by each time. 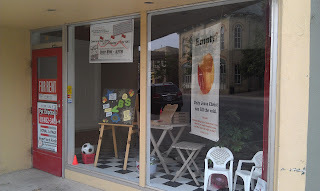 Currently, we drive past a “second hand” store that has five large windows on the main street of town. Although it’s only a “second-hand” store, the window displays they create and set-up are delightful to look at and are timely with the seasons, making people want to study their displays. 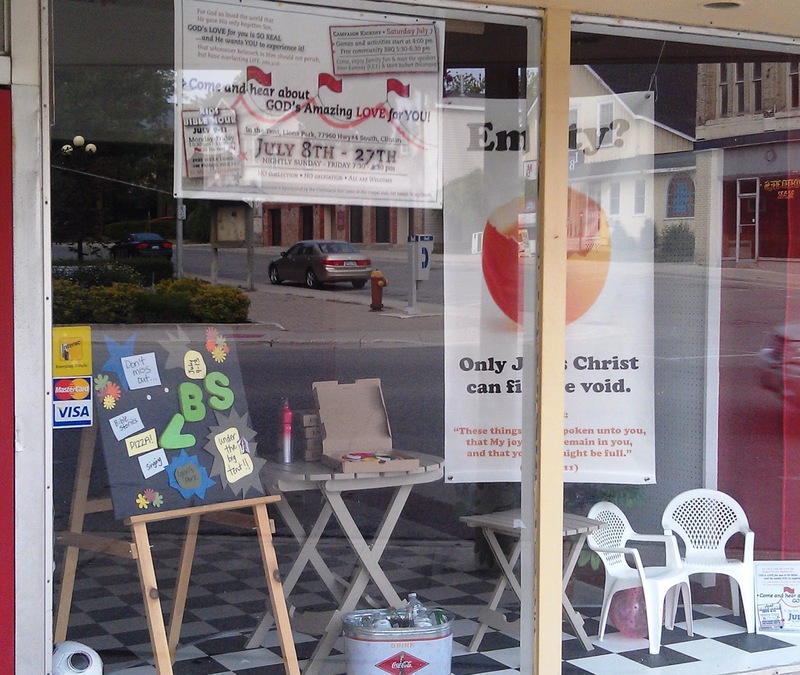 Knowing how visually engaging signs and window displays can be I thought about how wonderful it would be to use the “unattractive” window space of an empty store front to display the Gospel message. Once I located an empty store with a good window space, I contacted the real estate agent listed on the “For Rent” sign in the window. 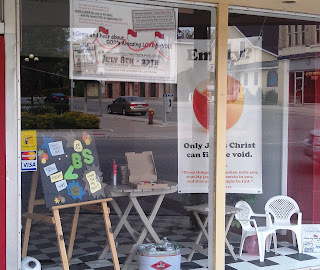 I explained to her we were a small church group that would like to use the window space for timely, seasonal displays while incorporating awareness of our local church. To further “sell” my idea to her, I also said something about helping to “beautify the downtown” instead of “unsightly empty stores.” I said we would be able to pay a little something for their hassle - $50 per month. that we would also be able to completely vacate the building in the event that they would get it rented out. It was easy to agree to those conditions and we arranged for a time to meet to get the keys. It was wonderful timing as we were able to “advertise” the series of summer Gospel tent meetings our assembly was planning and a Community BBQ at the tent site. The Ten Commandments along with the ‘Good News” of Salvation through Jesus was boldly displayed another month. Doing a window display involves a desire to reach lost souls for the LORD, along with the creativity to display the Gospel in an engaging and attractive manner. Several Christians working as a team, using their various gifts the LORD has given them, spreads the “work-load” out. It takes time to design, create and then put the display in place. We will never know this side of Eternity, the value of “advertising” the Gospel of our LORD Jesus Christ. A window display in an empty store may be a stepping stone the LORD will use to draw precious souls to Himself. Invited submission from Shirlee Groothuis (click on her name to email your inquiries) in fellowship at the Clinton, ON Gospel Hall.